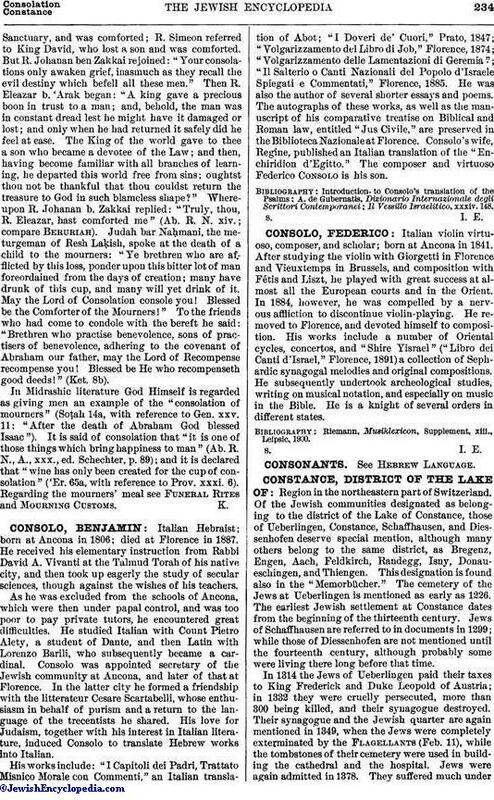 Italian violin virtuoso, composer, and scholar; born at Ancona in 1841. After studying the violin with Giorgetti in Florence and Vieuxtemps in Brussels, and composition with Fétis and Liszt, he played with great success at almost all the European courts and in the Orient. In 1884, however, he was compelled by a nervous affliction to discontinue violin-playing. He removed to Florence, and devoted himself to composition. His works include a number of Oriental cycles, concertos, and "Shire Yisrael" ("Libro dei Canti d'Israel," Florence, 1891) a collection of Sephardic synagogal melodies and original compositions. He subsequently undertook archeological studies, writing on musical notation, and especially on music in the Bible. He is a knight of several orders in different states. Riemann, Musiklexicon, Supplement, xiii., Leipsic, 1900.